We are providing our patrons with this exclusive range of best quality Work Platforms that are available with us in various kind of size specifications. 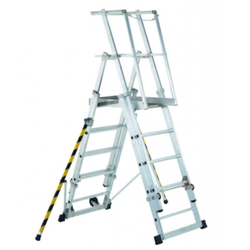 In this whole quality range we are offering Industrial Steps, Platform Steps, Mobile Access Steps and Work Platforms. Made from best quality raw material, this whole range can be availed form us in the most comprehensive and industry leading prices. Customers can avail this range from us as per their requirements and we can also customize these. We are a prominent organization engaged in offering the best ZAP Work Platforms. These products are manufactured by making use of supreme quality basic material, which is sourced from the established vendors of the markets. Further, we meticulously design these products while keeping in mind requirements of clients and industry laid parameters. To cater to the diversified requirements of the clients, we offer these products in different specifications. We hold all the aces in designing and developing qualitative ZAP Telescopic Work Platforms. The entire production process of these products is meticulously carried out in complete adherence with the defined parameters of the industry. Furthermore, we design these products while taking into consideration latest EU directives for working at heights. Keeping in mind multifarious demands of the clients, we offer these products in different specifications. Looking for Work Platforms ?